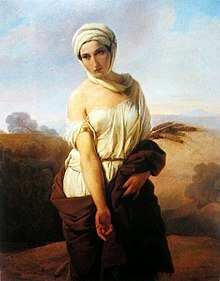 Ruth (/ruːθ/; Hebrew: רוּת, Modern: Rut, Tiberian: Rūθ), is the title character of the Book of Ruth. In the narrative, she is not an Israelite but rather is from Moab; she marries an Israelite. Both her husband and her father-in-law die, and she helps her mother-in-law, Naomi, find protection. The two of them travel to Bethlehem together, where Ruth wins the love of Boaz through her kindness. She is one of five women mentioned in the genealogy of Jesus found in the Gospel of Matthew, alongside Tamar, Rahab, the "wife of Uriah" (Bathsheba), and Mary. Elimelech, a man of Bethlehem-Judah, with his wife, Naomi, and his two sons, Mahlon and Chilion, went in time of famine and sojourned in the land of Moab. There Elimelech died, and the two sons married, Mahlon taking Ruth as his wife, and Chilion taking Orpah—both women of Moab, where both sons likewise died. Naomi heard that the famine in Judah had passed, and determined to return home. Ruth, in spite of the dissuasion of Naomi, accompanied her mother-in-law to Bethlehem. The two women arrived in Bethlehem at the beginning of barley harvest in a state of dire poverty. Elimelech had an inheritance of land among his brethren, but Naomi will be compelled to sell it unless she can find a Goel, that is, a kinsman of Elimelech who could assert Elimelech's inheritance rights. Elimelech had a prosperous relative in Bethlehem whose name was Boaz, and who, like others, was engaged in the harvest. Naomi sent Ruth to glean in his fields, and, after he had spoken kindly to her and shown her some favors, she, still acting upon the advice of her mother-in-law, approached Boaz at night and put herself in his power. Boaz was attracted to her, but informed her that there was a kinsman nearer than he who had the first right to redeem the estate of Elimelech and that it would be necessary for this kinsman to renounce his right before Boaz could proceed in the matter. Accordingly he called this kinsman to the gate of the city before the elders and told him of Ruth's situation and his right to redeem the estate and to marry Ruth. The kinsman declared that he did not desire to do so and drew off his shoe in token that he had renounced his rights in favor of Boaz. Boaz bought the estate from Naomi and married Ruth. Ruth and Boaz became the parents of Obed, who became the father of Jesse, the father of David. Boaz of Judah blessed Ruth for her extraordinary kindness both to Naomi of Judah and to the Judean People (Ruth 3:10). "And he [Boaz] said, 'May you be blessed of the Lord, my daughter; your latest act of kindness is greater than the first, not to follow the young men, whether poor or rich.'" Commentary of Rashi (c. 1040-1105 CE) regarding the first act of kindness: "that you did with your mother-in-law". Ruth's kindness as noted in the Book of Ruth by Boaz is seen in the Jewish Tradition as in rare contradistinction to the peoples of Moab (where Ruth comes from) and Amon in general, who were noted by the Torah for their distinct lack of kindness. Deut. 23:5: "Because they [the peoples of Amon and Moab] did not greet you with bread and water on the way when you left Egypt, and because he [the people of Moab] hired Balaam the son of Beor from Pethor in Aram Naharaim against you, to curse you." Rashi notes regarding Israel's travels on the way: "when you were in [a state of] extreme exhaustion." According to the Ruth Rabbah, Ruth was Orpah's sister and the two were daughters of Eglon, the king of Moab; according to the same text, Eglon was the son of Balak. Tamar Meir of the Jewish Women's Archive writes that Ruth and David being descended from these two men is seen as a "reward" for them. For Balak, it is his reward for building altars and for Eglon, it is his reward for "arising upon hearing the name of God from Ehud son of Gera". The same text says that Ruth did not convert during her marriage to Mahlon, contradicting other rabbinic literature, which says that Ruth formally converted to Judaism for the sake of marrying Mahlon but did not fully accept the faith until later. 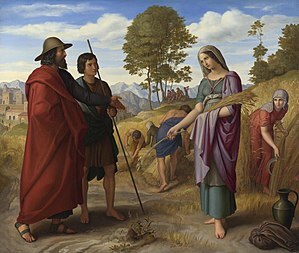 Josephus viewed the Book of Ruth as historical and referenced it in his Antiquities of the Jews. 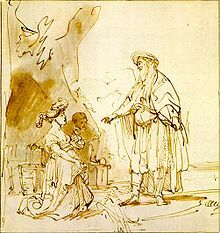 Yitzhak Berger suggests that Naomi's plan was that Ruth seduce Boaz, just as Tamar and Lot's daughters all seduced "an older family member in order to become the mother of his offspring." At the crucial moment, however, "Ruth abandons the attempt at seduction and instead requests a permanent, legal union with Boaz." Ruth is one of five women mentioned in the genealogy of Jesus found in the Gospel of Matthew, alongside Tamar, Rahab, the "wife of Uriah" (Bathsheba), and Mary. Katharine Doob Sakenfeld argues that Ruth is a model of loving-kindness (hesed): she acts in ways that promote the well-being of others. In Ruth 1:8–18, she demonstrated hesed by not going back to Moab but accompanying her mother-in-law to a foreign land. She chose to glean, despite the danger she faced in the field (Ruth 2:15) and the lower social status of the job. Finally, Ruth agrees with Naomi’s plan to marry Boaz, even though she was free of family obligations, once again demonstrating her loyalty and obedience (Ruth 3:10). Barry Webb argues that in the book, Ruth plays a key role in Naomi's rehabilitation. Ruth is commemorated as a matriarch in the Calendar of Saints of the Lutheran Church–Missouri Synod on 16 July. Francesco Quaresmi in the early 17th century reported that Turks and Orientals generally believed that the structure contained the tombs of Jesse and Ruth. According to Moshe Sharon, the association of the site with Ruth is very late, starting in the 19th century. It receives numerous visitors every year, especially on the Jewish holiday of Shavuot, when the Book of Ruth is read. Haim Horwitz in his 1835 book on Israeli holy sites Love of Jerusalem discusses the oral tradition that the tomb houses the grave of Ruth as well as that of Jesse, who is mentioned in earlier writings. Menachem Mendel of Kamenitz wrote in 1839, "Also in the vineyard was a shelter with 2 graves: one of Jesse, father of David, and one of Ruth, the Moabite." Ruth is one of the Five Heroines of the Order of the Eastern Star. Ruth was played by Elana Eden in Henry Koster's The Story of Ruth (1960); the film depicts Ruth as a pagan priestess prior to her religious conversion. Sherry Morris portrayed her in The Book of Ruth: Journey of Faith (2009). 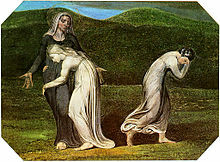 In English literature, John Keats in "Ode to a Nightingale" references Ruth as isolated and grief-stricken when laboring in exile: "Perhaps the self-same song that found a path/Through the sad heart of Ruth, when, sick for home,/She stood in tears amid the alien corn;"
^ a b c d e f g h i j k l m n Barton, George A. (1936). "Ruth, Book of". Jewish Encyclopedia. New York: Funk & Wagnalls Co.
^ a b Weren, Wim J. C. (1997). "The Five Women in Matthew's Genealogy". The Catholic Biblical Quarterly. 59 (2): 288–305. JSTOR 43722942. ^ a b c d Meir, Tamar. "Ruth". Jewish Women's Archive. Retrieved 9 November 2017. ^ "Book of Ruth". Catholic Encyclopedia. Retrieved 9 November 2017. ^ Berger, Yitzhak (2009). "Ruth and Inner-Biblical Allusion: The Case of 1 Samuel 25". JBL. 128 (2): 268. Emphasis original. ^ a b c Katherine D. Sakenfeld, Ruth (Louisville: John Knox Press, 1999), 11–12. ^ Barry G. Webb, Five Festal Garments (Leicester: Apollos, 2000), 43. ^ Claude Reignier Conder, Herbert Kitchener,The Survey of Western Palestine: Memoirs of the Topography, Orography, Hydrography, and Archaeology, Committee of the Palestine Exploration Fund, London, 1883, Vol 3 pp.327-8. ^ Franciscus Quaresmius, Historica theologica et moralis Terrae Sanctae, 1639, vol 2 p.782. ^ Moshe Sharon, Corpus Inscriptionum Arabicarum Palaestinae, Vol 5, H-I BRILL, 2013 pp. 45–52. ^ "Converts pay homage to Ruth at her Hebron tomb". The Jerusalem Post | JPost.com. Retrieved 28 January 2016. ^ "The first Holy Land hotelier". The Jerusalem Post | JPost.com. Retrieved 28 January 2016. ^ Cook, David G.; Cohen, Sol P. Book of the Occurrences o f the Times to Jeshurun in the Land of Israel. repository.upenn.edu. Retrieved 28 January 2016. ^ Crowther, Bosley (22 December 1960). "Screen: 'Story of Ruth':Biblical Tale Opens at Two Theatres". The New York Times. Retrieved 9 November 2017. ^ "The Book of Ruth: Journey of Faith (2009)". Rotten Tomatoes. Retrieved 9 November 2017. ^ Vendler, Helen (1985). The Odes of John Keats. Harvard University Press. pp. 102ff. Wikimedia Commons has media related to Ruth. Wikimedia Commons has media related to Tombs and graves of saintly people in Judaism.